Here are some TV shows, albums, books, and blogs I've been enjoying this month. Borgen. Look. There's no Josh Lyman (yeah, I loved Josh - who didn't? ), and the dialogue isn't quite as fast and funny as Aaron Sorkin-style writing, but if you liked The West Wing, you will have to like Borgen, a Danish drama about the first female Prime Minister in Denmark - her cabinet, her family, and the government's relationship to the media. I don't want to give anything away, but if you were interested in Anne-Marie Slaughter's article at Atlantic Monthly this week questioning what it means for women to "have it all," you will love watching Borgen's answer as Prime Minister Birgitte Nyborg wrestles with her work/family balance. And, as a student of intercultural studies, I also have to say that it's fascinating to observe this small, wealthy, post-Christian European country through its own eyes. Rain for Roots. We've been listening to these folk songs for little ones quite a bit over the last month. With lyrics by Sally Lloyd Jones and music by Sandra McCracken, Ellie Holcomb, Flo Paris, and Katy Bowser, they satisfy me both in terms of musical quality and content -- and Rosie LOVES them. My favorite thing about them is that each song points to God. A lot of Christian resources for kids tend to be moralistic, focusing on encouraging good behaviors - be patient, share, don't complain, obey. And, sure, kids need to be taught these things. But in training our children, it's all too easy to subtly teach them to rely on her own ability to be good and acceptable to God, rather than to rely on God himself. Who heard Daniel when he prayed? Who helped him not be afraid? Who stayed beside him in that den? Who brought him safely out again? It’s God who kept him in his care. He’ll keep you, too--no matter where! This latest album from The Welcome Wagon is beautiful. My sister sent it to me for my birthday, and she reviewed it here. On the blog front, this month I've become a huge fan of D.L. Mayfield's writing, and I love the stories Jessica Goudeau shares at Love Is What You Do. Both of these women work with refugees, and some (though not all) of their writing relates to that. Incidentally, this month I've been volunteer-teaching a group of Burmese refugees at a sewing factory in Gas City. It's worlds different than what I usually do, teaching wealthy Korean college students, and it's a challenge. I am stunned by the histories of these Burmese people, and by their resilience and work ethic and hope. And, frankly, I can't wait to see Brave. In "God", "a few things", "book reviews", "books", "fashion", "intercultural studies", "music", "parenting", "tv"
I will say that one thing I've grown to appreciate in the three and a half years I've been parenting is the value of waiting. When Rosie was a baby, I spent way too many hours reading books and making charts and wondering what I was doing wrong as I tried to get her to sleep through the night. The more I talked to other moms, and read other blogs, the more I realized that there wasn't one right way to parent, and that the fact that Rosie wasn't sleeping through the night wasn't a sign that i was parenting wrong. For me, having patience as I taught my daughter that she was heard and safe and cared for was the right thing. It was the same with potty training. I pushed Rosie to do it when I was ready and she wasn't, and it didn't work. Months later, when she was ready for it, potty training was a breeze. It took a day and a half. So with the pacifier thing, I've been waiting. I ignored the doctor and dentist who suggested I get rid of it. Of course, I haven't been totally passive. We did restrict paci usage to bed or rest time only. And we have talked on plenty of occasions about what it means to become a big girl. But my intuition told me that I was not to be the one to force my daughter to give up her dearest comfort (the mere mention of getting rid of it elicited tears, every time) and "grow up". I kept thinking about the story Grams tells of Aunt Patty, stubbornly throwing her pacifier in the fire place and declaring she was done. I wanted to wait until Rosie was ready, like little Patty, to resolve for herself. 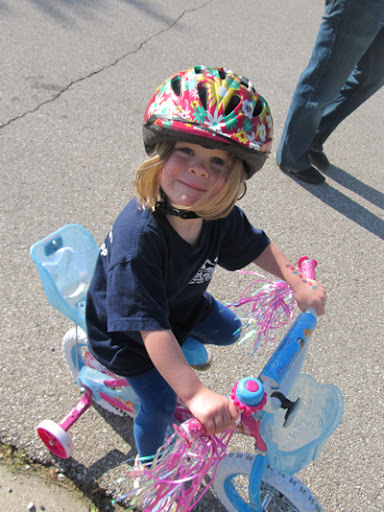 We had mentioned -in passing, maybe twice- that bikes were for big girls. 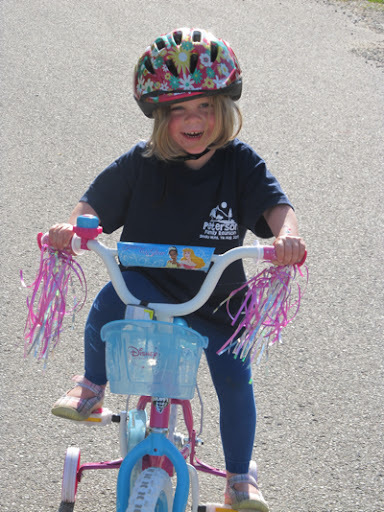 And so on Saturday when Rosie saw the neighborhood girls riding bikes again, she came straight home and threw her pacifier in the trash. "I want a bike," she said. And she went to sleep that night, and the next, without even a single tear. 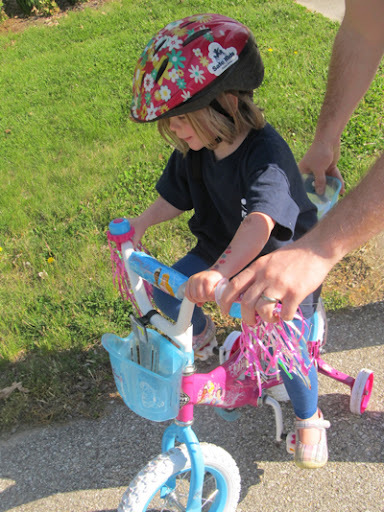 On Sunday she picked this bike out, and today she has ridden up and down our street for about four hours. Waiting until your kid is ready makes parenting so much easier. In "Owen", "Rosie", "bikes", "parenting", "patience", "princesses", "sleep", "thoughts"